The Atmospheric Infrared Sounder (AIRS) instrument on NASA's Aqua spacecraft was originally designed to measure atmospheric water vapor and temperature profiles for weather forecasting. Now, monitoring the growth in the global levels of CO2 has become a major part of the AIRS mission. AIRS measures the distribution of CO2 in the mid troposphere at 100 km resolution and is able to map the global distribution of CO2 every day. The Aqua satellite is part of the "A-Train" which consists of five satellites flying in formation around the globe. Source: NASA. Aqua, Latin for water, is a NASA Earth Science satellite mission named for the large amount of information that the mission is collecting about the Earth's water cycle, including evaporation from the oceans, water vapor in the atmosphere, clouds, precipitation, soil moisture, sea ice, land ice and snow cover. Aqua was launched on May 4, 2002 and carries six instruments (CERES, AIRS, AMSU, HSB, MODIS, and AMSR-E). Aqua was the first member launched of a group of satellites termed the Afternoon Constellation (or A-Train). More on this satellite on the Aqua mission page. 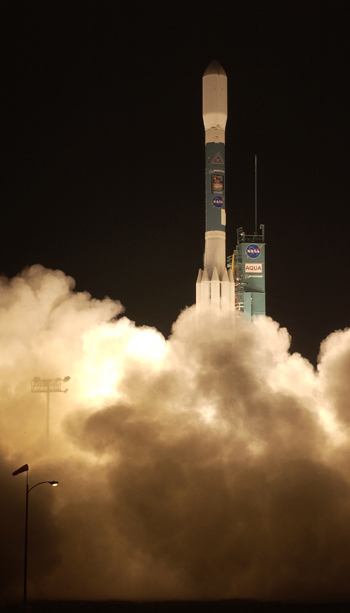 Aqua was launched aboard a Delta 7920-10L rocket at 2:55 a.m. PDT on May 4, 2002. Photo: NASA/Bill Ingalls.